81 year old female with a thyroid nodule. Diff-Quik and Papanicolau-stained aspirate slides show a diffuse population of cells present both singly and in clusters/sheets as well as a microfollicular pattern in a bloody background. 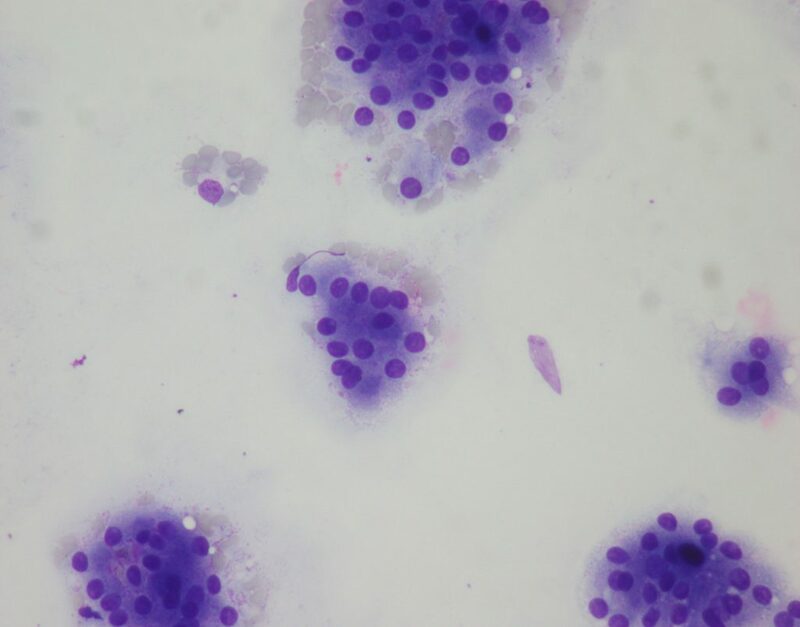 These cells are a good example of Hurthle cells with ample, eccentric, somewhat granular-appearing cytoplasm and predominately round nuclei with nucleoli. 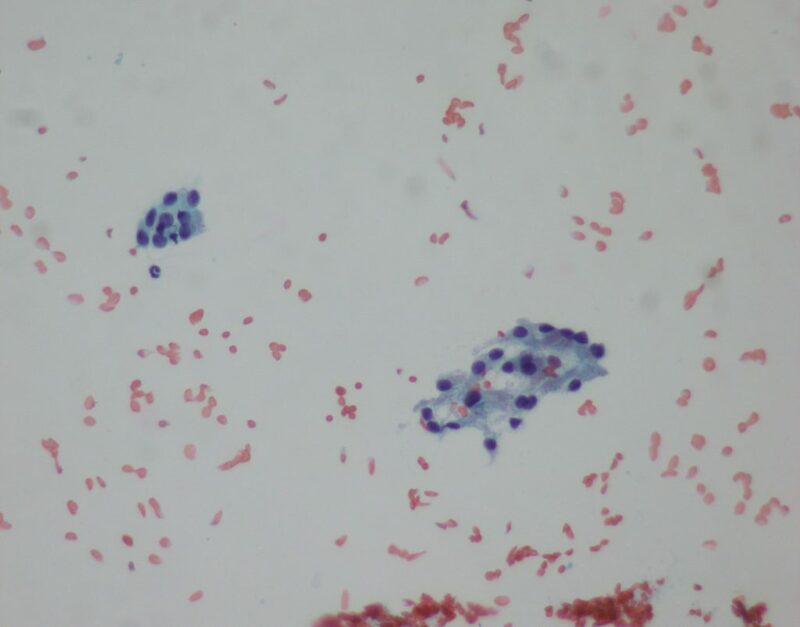 The granularity of the cytoplasm is better visualized on Pap-stained sections, with reddish-colored granules visible within pale blue cytoplasm. Also notable in this case is the lack of normal follicular cells and lack of colloid. 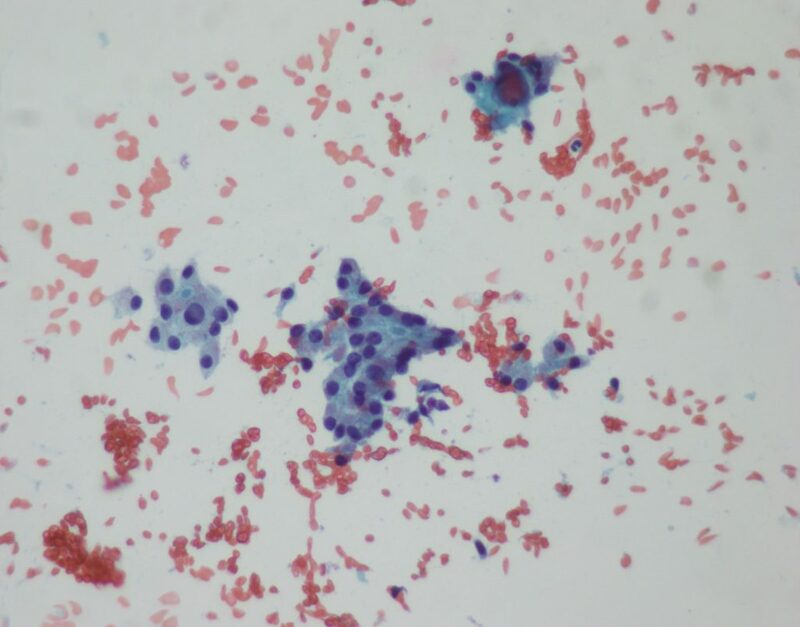 The presence of abundant Hurthle cells on cytologic preparations raises a broad differential diagnosis. Hurthle cell change can be seen as a reactive process in conditions such as Hashimoto thyroiditis. However, in Hashimoto thyroiditis, a background of increased lymphocytes with potential lymphoid follicles and lymphocytes interspersed amongst the epithelial cells would be expected; those features are absent in this case. Hurthle cell change may also be seen as a metaplastic-type change in benign adenomatoid (colloid) nodules; however, in this case the specimen is composed nearly exclusively of Hurthle cells, without follicular cells or background colloid to suggest an adenomatoid nodule. A cellular specimen with exclusively or nearly exclusively composed of Hurthle cells is suggestive of a Hurthle cell neoplasm – either Hurthle cell adenoma or Hurthle cell carcinoma. 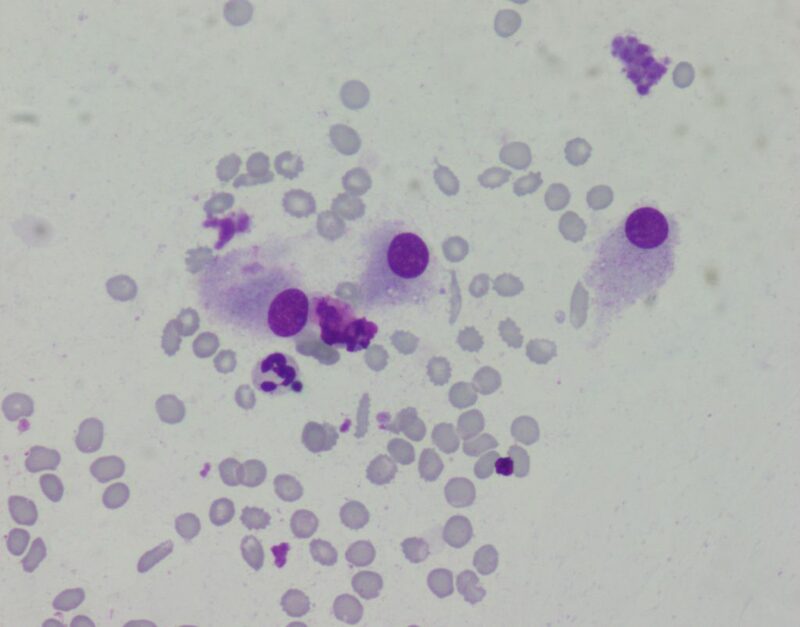 The difference between a benign and malignant Hurthle cell neoplasm requires assessment of the lesional border to look for capsular or vascular invasion, which is not possible with FNA specimens. Papillary thyroid carcinoma (PTC) would show enlarged nuclei with nuclear grooves and scattered nuclear pseudoinclusions. PTC cells typically have less cytoplasm than seen in Hurthle cells also. An oncocytic variant of PTC is recognized. Those cases show PTC-like nuclei within cytoplasm resembling Hurthle cells, whereas in this case the nuclei were round and without grooves or pseudoinclusions. 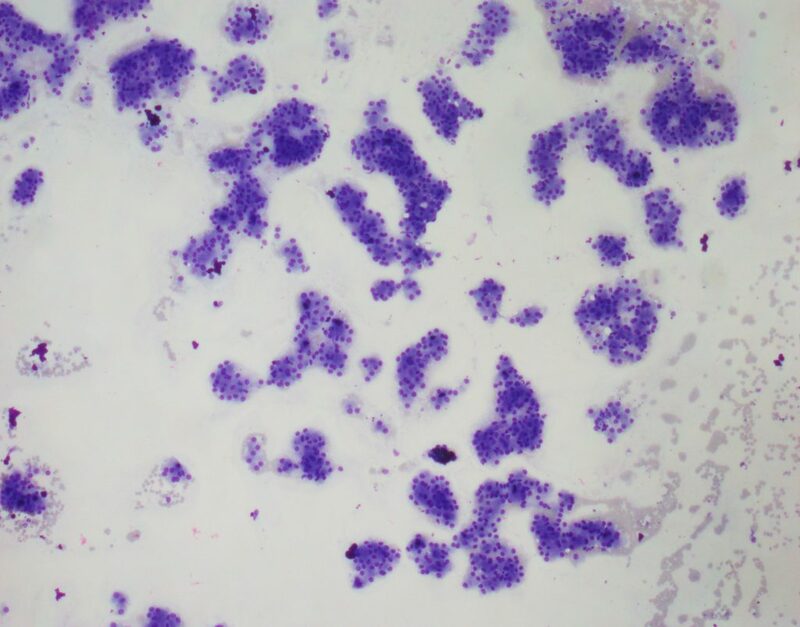 While in this case, the patient has a history of a prior carcinosarcoma of the uterus, the morphology and uniformity of the cells in this case are more consistent with Hurthle cells than metastasis. Ali, SZ and Cibas, ES (eds). 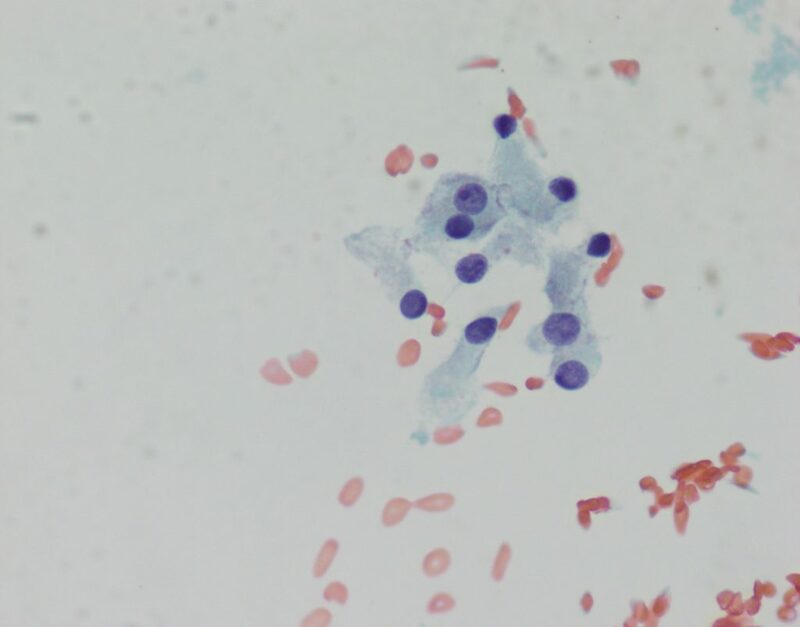 The Bethesda System for Reporting Thyroid Cytopathology. Springer Science+Business Media. 2010.